Whilst Hitchcock was still in Munich directing the The Mountain Eagle, Michael Balcon had already chosen the director's next project for Gainsborough — an adaptation of Marie Belloc Lowndes' popular 1913 novel The Lodger. News of the film was carried by the British press at the start of 1926 and matinée idol Ivor Novello was announced as the lead in February. With typical efficiency, Eliot Stannard had completed the scenario by February. In the original novel, the lodger is likely a serial killer, but to appease the box-office, Stannard's treatment reveals Novello's lodger to be innocent of the killings. Once the scenario was complete, Hitchcock began sketching and storyboarding the entire film. Marie Ault and Arthur Chesney were cast as the landlords whilst June Tripp, a dancer and music hall comedian who had previously worked with Novello, was cast as their daughter, Daisy. To add romantic and dramatic tension to the story, Stannard had given Daisy a policeman suitor and Malcolm Keen, fresh from working with Hitchcock in Munich was cast in the role. Filming began in February 1926 and was reportedly completed within six weeks. One of the earliest scenes to be filmed was shot at the Thames Embankment during the early morning of Friday 25th February. Fresh from Berlin, Hitch was so imbued with the value of unusual camera angles and lighting effects with which to create and sustain dramatic suspense that often a scene which would not run for more than three minutes on the screen would take an morning to shoot. One of the most memorable sequence in the film is when the Bunting's gaze apprehensively up at their kitchen ceiling, listening to the lodger pacing in the room above. The ceiling becomes transparent and, from below, we see Novello walking back and forth (across a thick sheet of toughened glass). The Lodger also marks the first known cameo appearance of Hitchcock, where he appears with his back to the camera in a newsroom. A second often-reported cameo in a crowd scene near the end of the film seems very unlikely to be the director. According to Ivor Montagu, the cameos were inspired by Hitchcock's admiration for director D.W. Griffith who often played small parts in his early films. It also seem likely that Hitchcock's wife, Alma Reville, has a cameo appearance in the film. By all accounts, release of the initial edit of the film was blocked by distributor C.M. Woolf, perhaps influenced by Graham Cutts, who had previously shelved Hitchcock's other two films. Feeling that the film could be improved, Balcon hired Ivor Montagu to re-edit The Lodger. They ran the film, with which at once I fell enthusiastically in love. Now, the hackneyed treatment of the plot and a weakness in characterisation makes it look primitive. Then, by contrast with the work of his seniors and contemporaries, all Hitch’s special qualities stood out raw: the narrative skill, the ability to tell the story and create the tension in graphic combination, and the feeling for London scenes and characters. 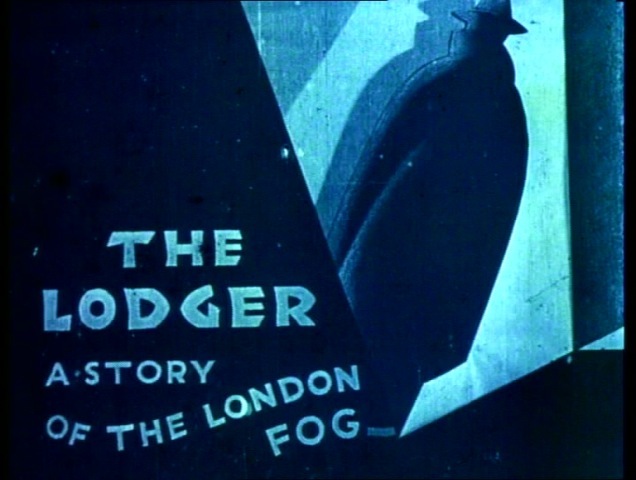 Montagu's claim that Hitchcock's edit contained up to 500 intertitles seems likely an exageration, but he worked with the director during the summer months to tighten up the film. One of the other improvements was to hire American poster artist Edward McKnight Kauffer to design the animated triangular title cards. A successful trade screening of the re-edited film in September overcame Woolf's prior objections and also opened the door to both The Pleasure Garden and The Mountain Eagle being released in the UK. The film began screening to the public on Monday 17th January 1927 at the Marble Arch Pavilion, Oxford Street, London. For further details, see dates of UK screenings. With the coming of sound, Maurice Elvey directed a remake of the film in 1932, again starring Ivor Novello. Shortly after arriving in America and whilst working on Foreign Correspondent (1940) in 1940, Hitchcock was involved with a radio adaptation of story which starred Herbert Marshall, Edmund Gwenn and Lurene Tuttle. Although he was named as the director of the episode, he was actually voiced by actor Joseph Kearns. In early 1942, the Los Angeles Times reported that Hitchcock was considering embarking on a colour remake of The Lodger following the completion of Saboteur (1942) but he was unable to obtain the film rights. By the end of 1942, the rights had been secured by 20th Century Fox who released The Lodger in 1944, directed by John Brahm and starring Laird Cregar in the title role, along with Merle Oberon, George Sanders, Cedric Hardwicke and Sara Allgood. The story was adapted once more for the Man in the Attic (1953), directed by Hugo Fregonese. A contemporary version of the story was filmed in 2009 as The Lodger, starring Alfred Molina, Hope Davis and Simon Baker. ↑ MacGilligan says filming began in March, but Leitch says filming started in June. Both are incorrect, as newspapers were reporting on location filming as early as February 1926. ↑ Cutt's may have been annoyed that Michael Balcon had loaned Novello to Hitchcock after Cutt's had made him a star in The Rat (1925) and The Triumph of the Rat (1926). ↑ BFI most-wanted: The Mountain Eagle — film historian Jenny Hammerton speculated that Wardour Films may have shelved "The Mountain Eagle" in favour of releasing "Downhill" in the UK instead, but the former did receive screenings over a 6 month period throughout the UK.